The LED edge lit 47G2 impressed us with both it's color and black level performance. Colors were bold but still realistic even on the standard setting prior to professional calibration. The picture handled warm interior and exterior scenes and dark scenes showed impressive contrast and detail. It did not have the oversaturated, other-wordly look of some LED televisions and we found just about everything we saw on it to be enjoyable to look at. When we saw the TruMotion 120Hz feature on the G2 we though maybe LG had been able to eliminate its deficiencies, but then we noted its flawed aspect when we viewed a quick scene from a movie clip. That is, it falsely eliminates too much natural background blur in movies, creating what we have termed "The Soap Opera Effect". It can make even the most high budget film look like it was shot on cheap video, we recommend turning this off if you watch lots of movies. Otherwise, it does its job in the 47G2 with fast motion scenes by reducing or eliminating trailing artifacts and motion blur that they can cause due to too slow a refresh rate. The G in the model number indicates that this LG LED television is equipped with Google TV along with the standard Smart TV online functionality included in many LG LED TVs. Google TV adds the full Chrome web browser, deep search features and more to your TV bringing the online experience to your living room. This TV even has access to the Android marketplace so many apps you ind on a smartphone or tablet can be run right on your TV. Side angle viewing quality is an impressive area of performance for the 47G2. It is much better than most of it's LED backlit and LCD competition even though there is still no comparison to plasma TVs in this area. Contrast remains solid up until about 35 degrees off center – which is a good result. Glass from edge to edge, that is that you see when you look at the LM620. The 5mm bezel is so small you probably wouldn't notice it if it wasn't pointed out. This single pane of glass look is one of our favorites and it looks impressive even when the television isn't on. 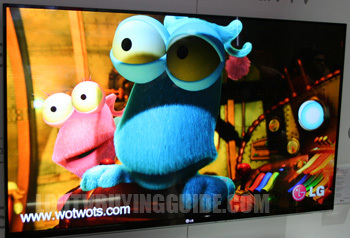 LG's 2012 line up would look great on the wall in just about any TV room. 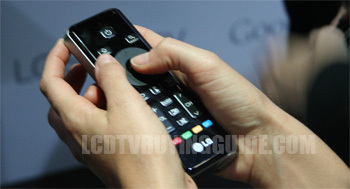 This shot shows part of the Google TV interface on the 47G2. Google TV functionality is included along side the expanded Smart TV features. The LG 55G2 has the newly 2012 introduced Google TV feature which allows for searching of its Android marketplace Apps and services. This TV has a special remote control that comes with the TV which enables a QWERTY keyboard type search. It's still the Magic Remote but enhanced for the Google TV application. This is one of the differentiating features of the G2 from other LG models with just the Smart TV suite but not the Google option. Google TV requires some typing and using the numbers on your remote to type like an old phone keypad or navigating an onscreen keyboard with a 5 way switch are both no fun. The Magic Remote sped up typing by being able to just point at the letters you want but the Google TV equipped LG televisions make it even easier by adding a full QWERTY keyboard to the already cool Magic Wand. On most TV's when 2 people play a video game in the same room on the same TV they are often forced to use split screen. The TV picture is split in half horizontally or vertically and each player not only gets a smaller view of the game, sometimes important screen area is cut off. LG's Dual Play technology utilizes the Cinema 3D to display both screens at the same time on the whole screen. Each player wears a different set of polarized glasses and only sees their game on the full screen..
What is FPR 3D Panel Technology?